Windows and patio doors require service and maintenance like most household items. Whether your problem is a piece of broken glass or a window that won’t open, National Glass in Newhall has been servicing windows, french doors and patio doors for the community for 50 years for a fraction of the cost of a new window or door. Dual Pane sliding vinyl window with a broken glass pane in Canyon Country, CA. When glass breaks it can be frustrating. Broken glass is unsightly, it allows dust and hot or cold air into your home and can pose a major safety hazard. National Glass can replace broken glass inside of your existing window frame at a fraction of the cost of a new window. 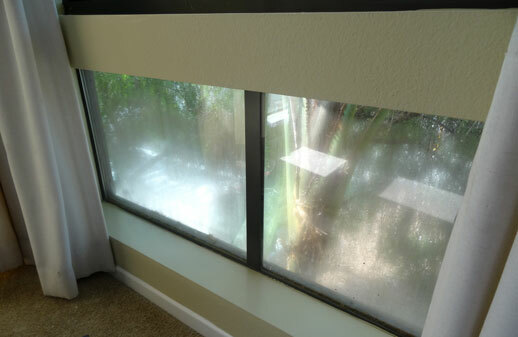 Dual pane windows have a seal between the glass panes to keep out moisture and dirt. Over the years this seal can fail, allowing water and dirt to slowly build up between the glass. The bad seals can also move out of the frame and snake around, creating an unsightly appearance. Give us a call today to see how we can solve this problem to restore your windows and doors to their original appearance. A broken seal between dual pane glass panes has allowed moisture and dirt into the area between the glass, creating a haze that cannot be cleaned - Downtown Los Angeles. Heat from direct sunlight has caused this decorative grid to come loose and fall over. Decorative metal grids between the glass pieces on a dual pane unit are a very popular way to add flair and character to windows. These features, meant to replicate the look of Revolutionary Era colonial windows, can fail and fall down in older windows especially if they are subject to direct sunlight. If you have this problem, National Glass has your solution. Here in Southern California the summer heat can cause your electric bill to spike through the roof. Did you know that in certain cases the dual panes in your home can be upgraded to reduce your electric bill while preserving your existing window frames? Dual pane replacement on a whole house or part of a house can be done quickly and more cost effectively than installing new or retrofit windows. Call today for details!